The Dolphin Research Center in Marathon, Florida, is one of my all-time, favorite travel destinations. It has been since I was a kid. As you may or may not know, my family has had a home in the Florida Keys for as long as I can remember. My grandparents built it long ago, and now my folks have it. 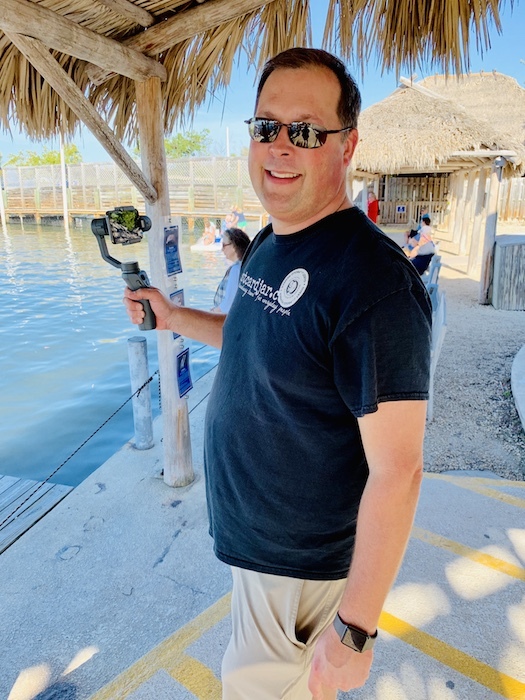 Needless to say, I’ve been blessed to be able to visit the Keys a LOT since I was young, and try to visit the Dolphin Research Center there every time we go. It’s super easy to find, too. Just watch for the giant dolphin that looks like it’s leaping over a parking lot at mile marker 59, Gulf side. I absolutely love this place. Home to 26 dolphins and four sea lions, the not-for-profit Dolphin Research Center cares for animals that are unable to survive in the wild because they were either born under human care or they were injured and had to be rescued. They work with and learn from their dolphins. And if a dolphin doesn’t want to participate in activities? That’s just fine. After all, who doesn’t have a bad day every now and again? 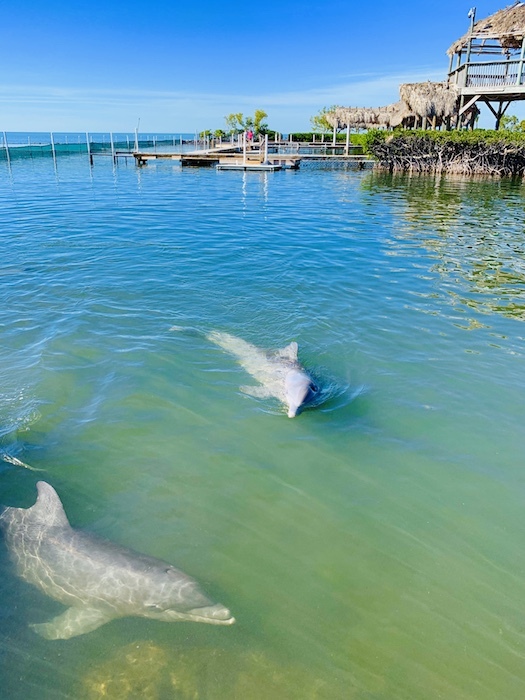 If you’re planning a visit to the Florida Keys, you simply MUST plan a stop at the Dolphin Research Center. It’s a wonderful place that I know you’ll love. And for when you go, here’s our list of seven tips to help make your visit memorable. I can’t imagine anything worse than pulling up for a once-in-a-lifetime encounter with marine mammals only to find that there are no available spots for the day. 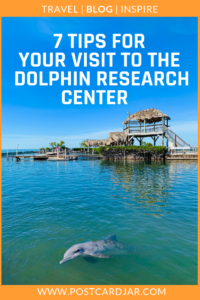 Whether you’d like to simply meet a dolphin, swim with one, or spend an entire day as a trainer, the Dolphin Research Center has a program for you. A simple visit to their website will help you pick the type of experience you want and will lock in your spot. If you’d like to do anything other that just watch the dolphins, it’s always a good idea to make a reservation in advance. 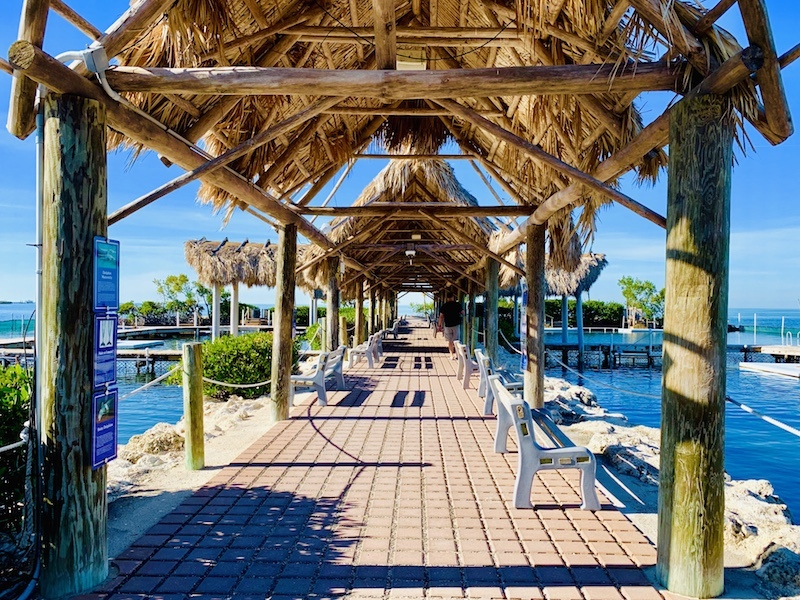 The Dolphin Research Center has brick sidewalks as well as boardwalks–it is a marine center after all. Folks come here to swim with dolphins and get in the water. Wear something sensible like sandals or slip-on shoes and you’ll do just fine. After all, you’re in the Florida Keys! If you’re planning to get in the water with the dolphins, it’s best to wear swim attire under loose clothing, so you don’t have to change there. Also, be sure to take your sun glasses and eco-friendly sunscreen. 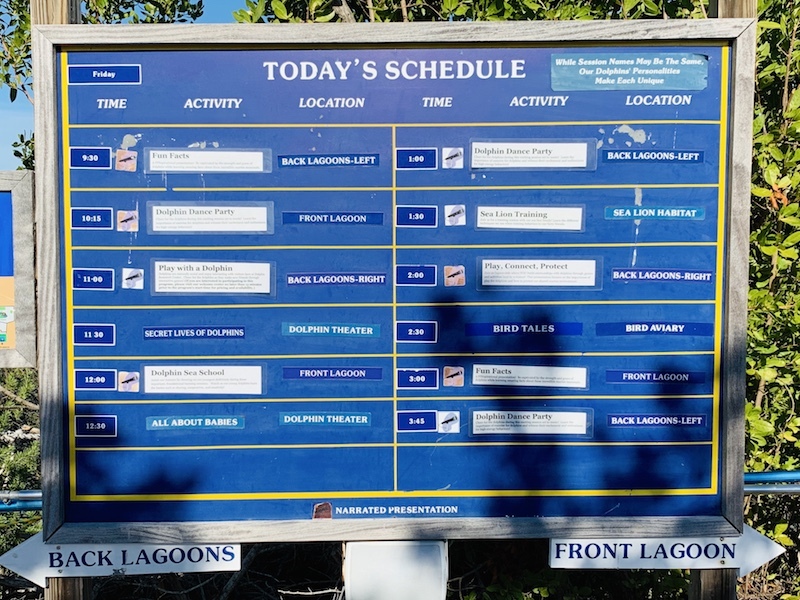 Located near the main lagoon is a large board with the day’s schedule. Check this board when you get there and you’ll be able to note the times and places for various activities during the day. Whenever a group of people has an encounter with dolphins scheduled, others are encouraged to watch. Each of these programs is used as an opportunity to teach guests about dolphins. The more you attend, the more you learn! The focus of the Dolphin Research Center is marine mammals, and the dolphins and sea lions are the definite stars. However, a number of other animals call the facility home, as well. Keep your eyes peeled, and see if you can spot any of the seven exotic birds, various pea fowl, eight cats, and the iguanas who spend their days here. But there are a number of other residents, as well, and they can be a little harder to spot so keep on the lookout. If you do decide to participate in a program with the dolphins, we recommend investing in the pictures taken by a Dolphin Research Center photographer. They will be better photographs than anything anyone in your party can take from a distance, and you know you’ll get a great photo memory of your experience. 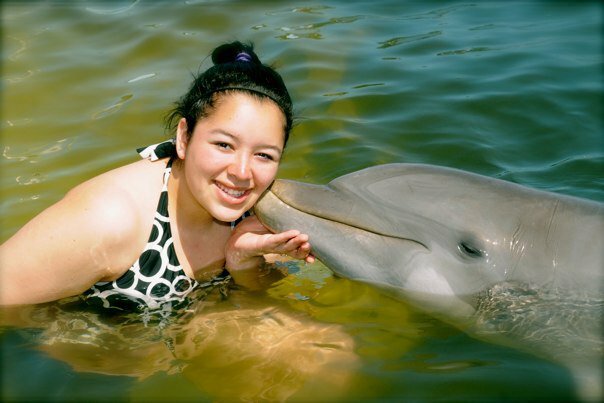 When we swam with the dolphins a few years ago, we purchased pictures through the Dolphin Research Center’s photo shop and are so glad we did. See our daughter, Meghan, below. We would have never gotten that shot. We have certainly enjoyed looking back at those photos and remembering our great time there. And we know that our purchase supports the facility and the care of our new dolphin friends. When we travel, we like to find souvenirs that are tasteful and meaningful, not cheap and kitschy. 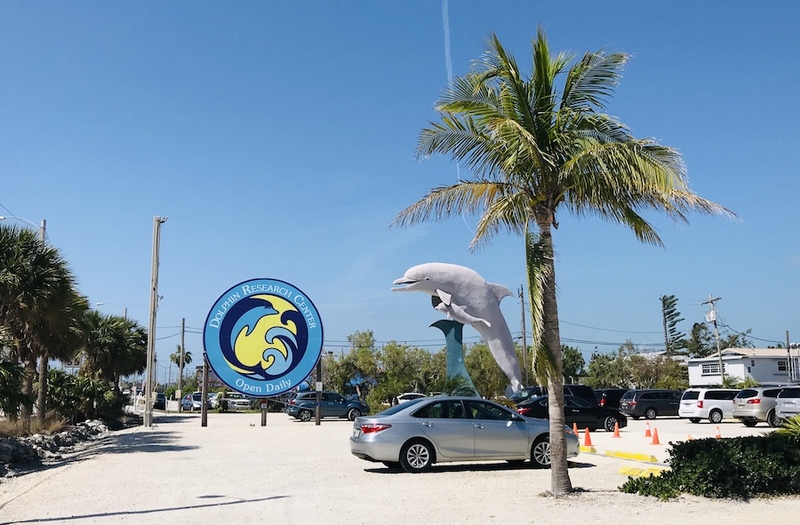 The gift shop at the Dolphin Research Center is a perfect place for us because it is full of unique items you won’t find elsewhere. Inside you’ll find paintings created by the dolphins (really!) 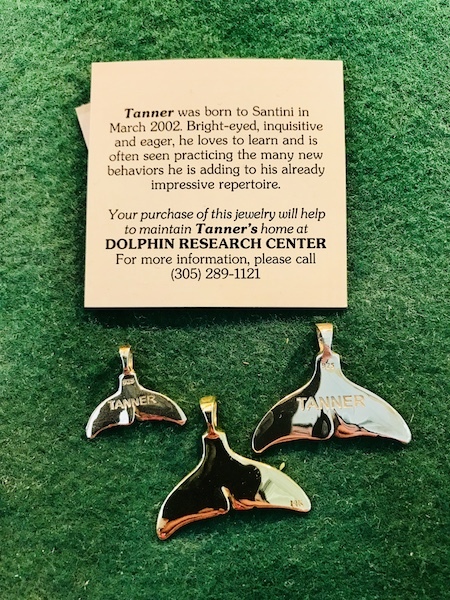 as well as jewelry including pendants made to look like the tail flukes of different dolphins in the facility’s pod. Each dolphin’s fluke is different than any other’s, kind of like a fingerprint. One of these charms makes a great memento from your day with the dolphins. 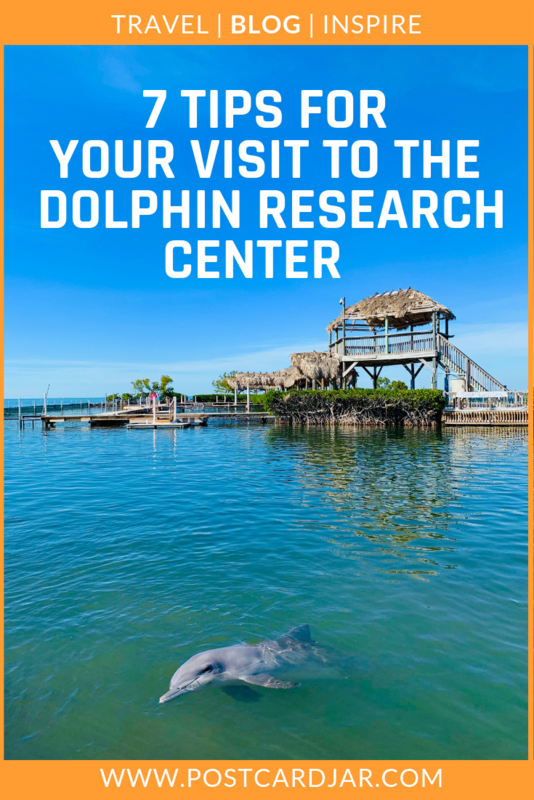 The Dolphin Research Center exists to promote education about marine mammals. I’ve been dozens of times, and think I’ve learned something new on each trip. Staff will answer any question you have and they provide excellent programming. In addition, they’ve even worked with classroom teachers over Skype to bring dolphins to students thousands of miles away. Check out the video below for an example of what you might learn on a visit. 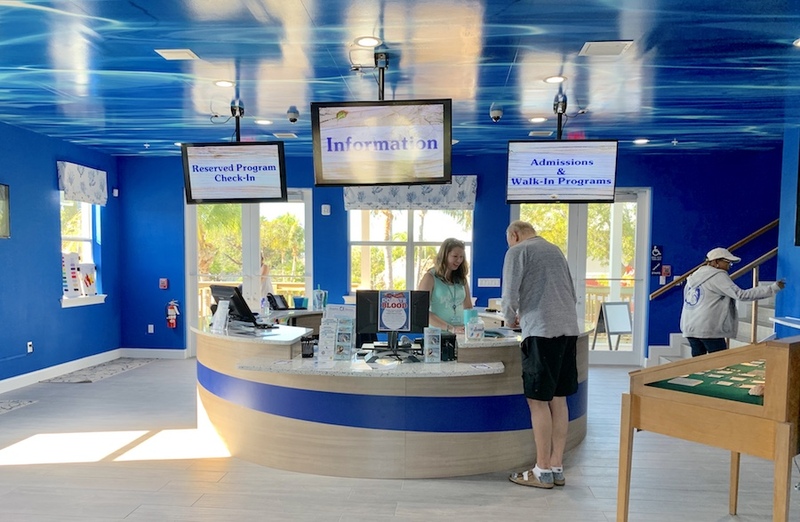 The Visitor’s Center at the Dolphin Research Center was recently expanded, and we think it looks great. Not only that, they put a lot of thought into making it a functional space. Here’s a picture of Steve’s dad checking it out for the first time. I just can’t say enough good things about the Dolphin Research Center. If you are planning a trip to the Florida Keys, put this spot on your must-visit list. You’ll be glad you did. 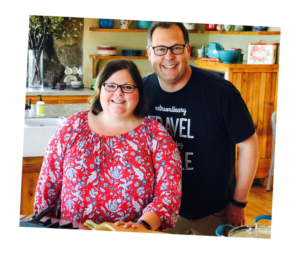 By the way, we were excited to include a video in this post. For Christmas, my parents gave us a gimbal to help us create videos for our blog. This was my first attempt at using it. I hope you enjoyed my new-found videographer skills. Your first video was really good! Good information, and I can confirm everything Steve says about this wonderful facility.